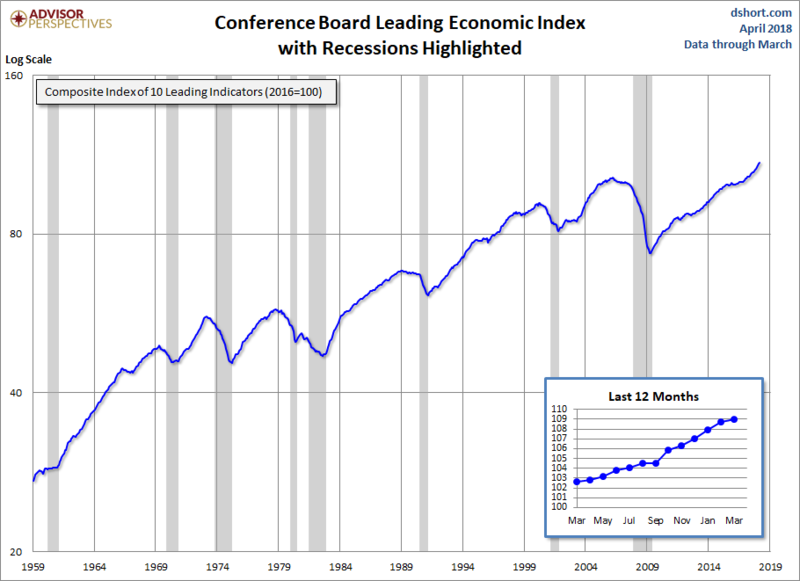 The latest Conference Board Leading Economic Index (LEI) for March increased to 109.0 from 108.7 in February. The Coincident Economic Index (CEI) came in at 103.4, up from the previous month. The Conference Board LEI for the U.S. increased again in March. Positive contributions from the yield spread, the ISM® new orders index and expectations for business conditions more than offset the negative contributions from the average workweek and initial claims for unemployment insurance (inverted). In the six-month period ending March 2018, the leading economic index increased 4.3 percent (about an 8.8 percent annual rate), much faster than its growth of 1.9 percent (about a 3.7 percent annual rate) over the previous six months. In addition, the strengths among the leading indicators have remained very widespread. Here is a log-scale chart of the LEI series with documented recessions as identified by the NBER. The use of a log scale gives us a better sense of the relative sizes of peaks and troughs than a more conventional linear scale.